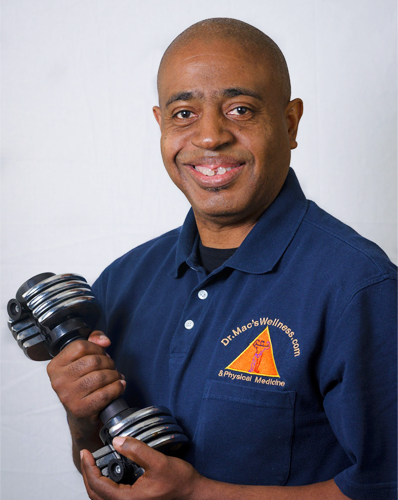 Dr. Henry McCleary (Dr. Mac) is a holistic doctor, he has been very successfully practicing in the Northern Virginia area for 25 years. His breakthrough rejuvenation system has proven that diminished health and vitality can be reclaimed by just about any proactive person at any age. Using Dr. Mac’s blueprint, you harness your simple, self-care practices and changes of habit. These practices cover the 4 essential keys to resolving the underlying stressors that lead to the breakdown of health including your nervous system, your endocrine system, detoxification, nutrition and fitness. The material he shares covers everything required to take control of your health and fitness, while dispelling the ever-growing number of fallacies and myths related to this subject. Dr. Mac’s fascinating and refreshing approach to body transformation includes topics on mind set, nutrition, a unique exercise program and blood sugar balance. This program will work for all ages, but offers additional specifics to the middle aged “Baby Boomers”. His unique ability of delivering his presentations in an upbeat and often humorous fashion, leaves his audiences with a new sense of excitement and motivation. Dr. Mac practices functional nutrition, and uses lifestyle as medicine for total wellness in his Dumfries, VA., “Dr. Mac’s Wellness Centre”. He incorporates nutrition, chiropractic, blood sugar balance, fitness and permanent weight control. His doctorate is in Chiropractic with certifications in spinal trauma and strength and conditioning. Other specialties of practice include nutrition, functional wellness. Reduce stress in all its forms, and aging suddenly slows dramatically. This is a message that Dr. Mac carries with him at all times. But he also shows you how to do it with his Maximize & Optimize approach for quickly reclaiming health, youth, and quality of life through your – preserving habits.